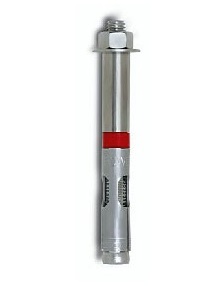 PRODUCT: Powers #5022, 3/8" X 4" Hex head Lok-Bolt Sleeve-Type Expansion Anchor. 50/Box. Price/BOX. DESCRIPTION: Loc-Bolt carbon steel expansion anchors have a one piece anchor body with an expansion mechanism which consists of a pair of interlocking independent wedges. Finish is galvanized. APPLICATIONS: Ccan be used in concrete, block, brick and stone. Extension sleeves can be added to create longer lengths.